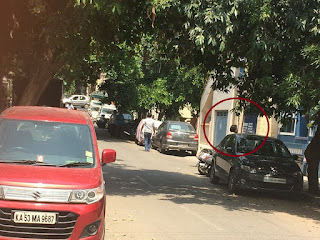 Mohan's Blog and Viewpoints: Parking Wars: Residents in the land of Gandhi taking up Gandhigiri ? 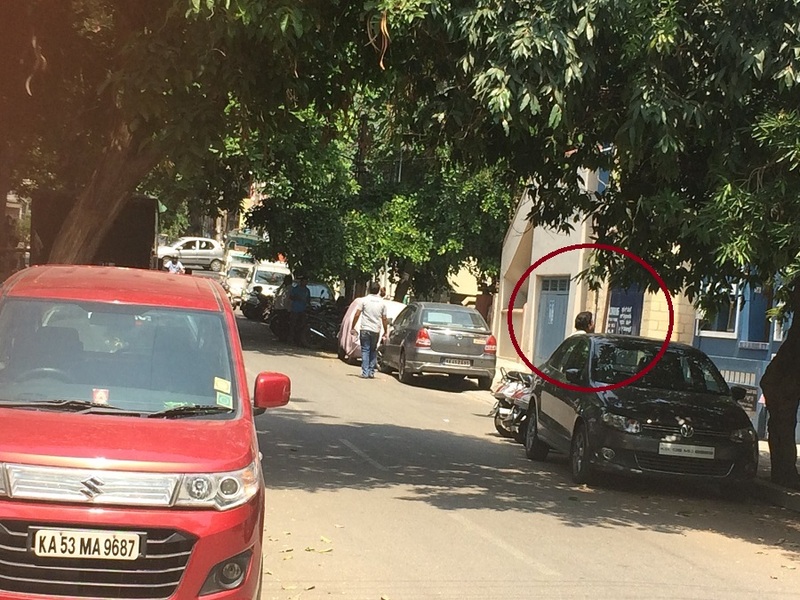 Parking Wars: Residents in the land of Gandhi taking up Gandhigiri ? 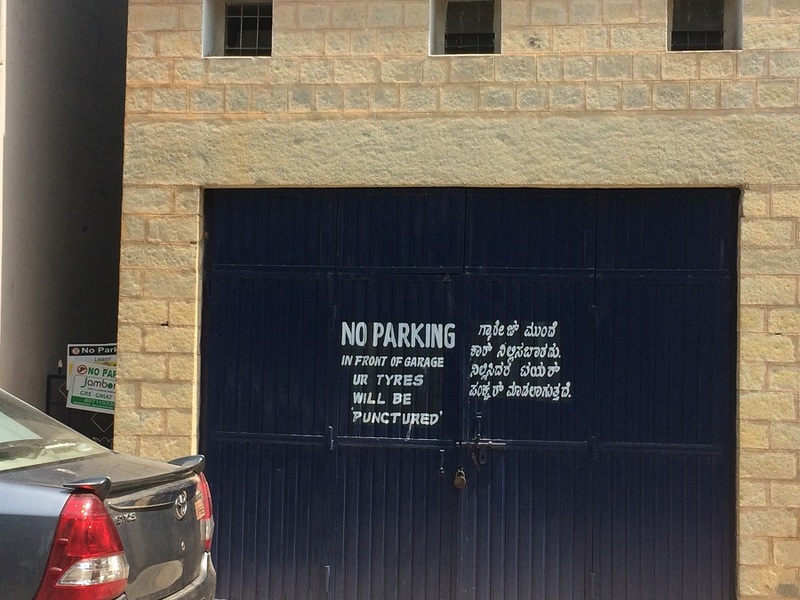 People in major urban cities like Bengaluru are on the edge over parking wars. Residents with bikes and cars – which most do find it an excruciating experience driving around neighborhoods looking for parking. Most gated communities and apartments have limited real-estate and deny parking for visitors. Walking around a side-street in Malleshwaram, a nice old subdivision in Bangalore, I came across the following warning posted ominously on a house’ garage door. I was both amused and perplexed by the warning message. Parking, especially illegal parking is certainly a nuisance in many neighborhoods, and at times I have had to ‘request’ offenders not to park in front of the gate of our house. However, I wonder if people really willing to take up law into their own hands and be uncivil and rude to their neighbors? First, there was the news of Shiv Sena Member of Parliment, Ravindra Gaikwad beatingan Air India staffer with slippers. The intelligence and middle-class were left wondering about Mr Gaikwad’s audacity in refusing to apologize and “demanding” his right to continue to fly Air India. We were also left to wonder about the impotence of fellow parliamentarians and elected representatives who barely uttered a pip against their esteemed colleague. After reading the article, I was left scratching my head over the message to the impressionable brides: expect your hubby to turn out to be a drunkard. So, what happens to the dreams and aspirations with which youngsters tie the knot; or for that matter the silly notion of love when an esteemed minister passes on this message? Speak of starting a new life on a wrong footing. With such messages coming from representatives, it is not surprising to see the public including denizens of Bangalore taking up arms. Many are showing willingness to be "violent" to protect the land around their property against neighbors and fellow residents who dare to park their vehicles.